Transport:Drive in - Drive Out. Lumbini Situated at the Terai plains of the southern Nepal, Lumbini is the place where Siddhartha Gautam, the Shakya Prince and the ultimate Buddha, the Enlighted One, was born in 623 BC. The sacred place, marked by a stone pillar erected by Emperor Ashoka of India in 249 BC, is listed as one of the World Heritage Sites. Today the holy site is being developed with international support as the supreme Buddhist pilgrimage and a symbol of world peace. The shrines and monastries that many countries have built or are still building reflect the architectural traditions of the respective countries, and thus giving Lumbini an international feel with a message of universal friendship and brotherhood. About 30km east of Lumbini is the village of Tilaurakot which is believed to have been the location of the Kapilvastu royal palace where the Buddha grew up as the Shakya dynasty prince, until he renounced it at the age of 29 in search of enlightenment.and tours in Kathmandu Valley with guide is also another flavour of this pilgrimage tours where u can enjoy with temple monuments art incarnation which is amazing to observe. -Full board Meal in Lumbini Breakfast,Lunch,Dinner Breakfast in Kathmandu Hotel. -Dinner in Bhojan Giriha with culture program. 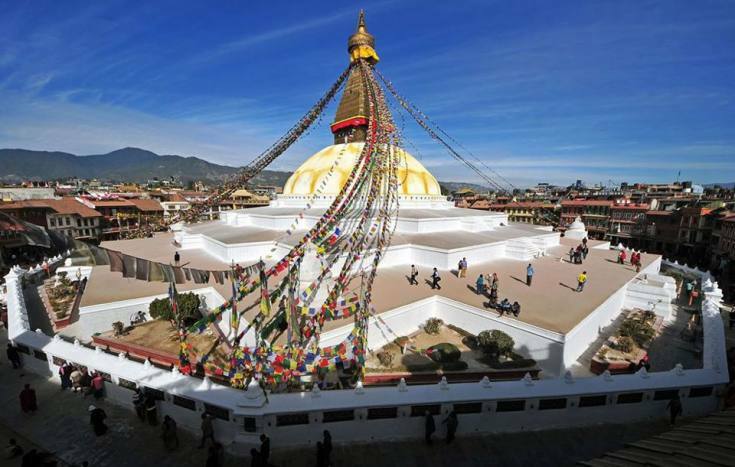 Day 04Fly back to Kathmandu and sightseeing at Boudha and swayambunath(monkey temple) overnight at guest house. Day 06Departure to your homeland "farewell"